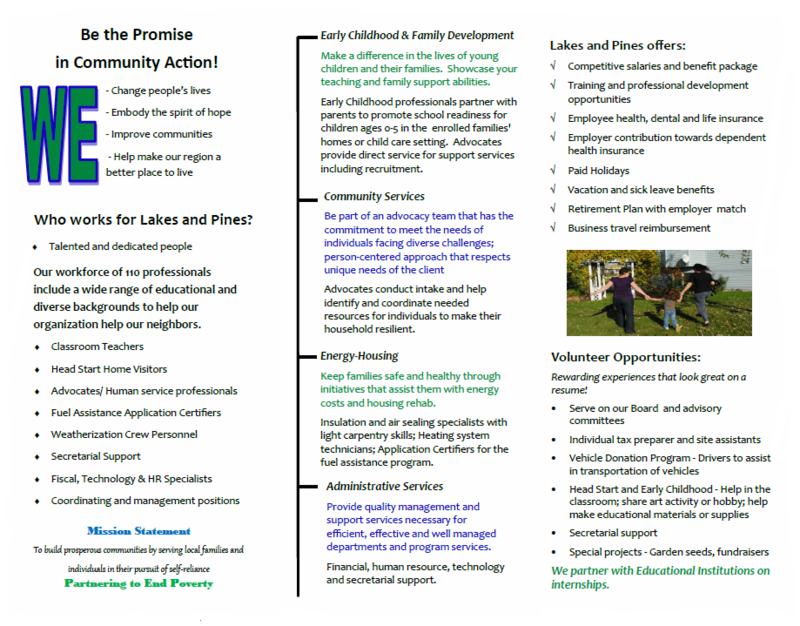 The Agency-wide Advocate is responsible for meeting the Agency’s mission as a team member in a comprehensive approach to community building by providing guidance, outreach, supportive services and referrals to resources which will enable community action program participants to create goals and identify barriers that with direction and support will increase financial resilience. 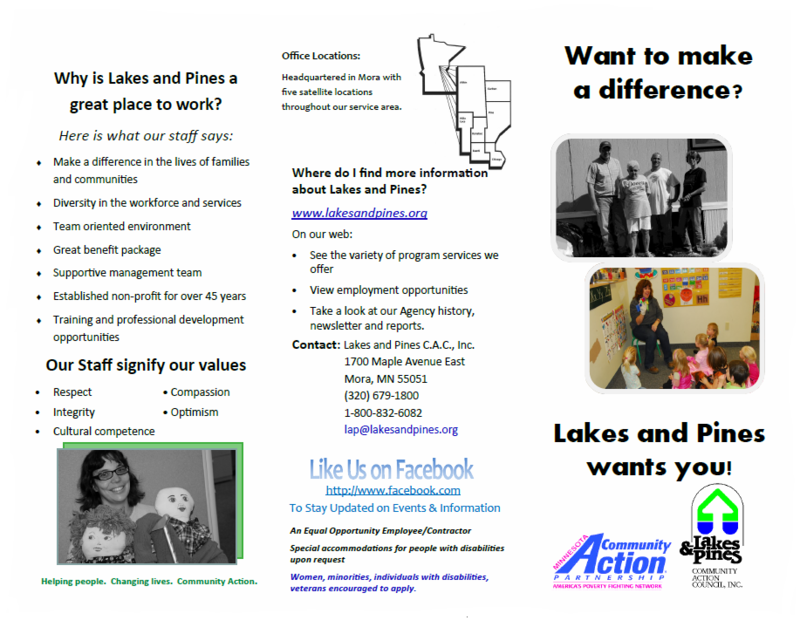 This position involves engaging the community, assessing the needs of participants, developing action plans, serving as a resource to participants, having a thorough understanding of services and supports available in the community, completing intake work and assessing a household’s eligibility for all programs administered by Lakes & Pines Community Action Council, Inc., and advocating for the rights of and services for low-income persons. Evaluating the level and type of supportive services based on participant’s goals and program guidelines. Completing program reports, as requested. Dealing discretely, tactfully and diplomatically with participants, co-workers, funders, community organizations, partners, government officials while maintaining client confidentiality and conducting oneself in a professional manner. Having knowledge and the ability to apply Agency policies and procedures, including safety, technology, data practices and other applicable ies, procedures and program regulations (including, but not limited to: Emergency Housing, Energy Assistance, Head Start, Supplemental Nutrition Assistance Program, MNsure, Social Security, Earned Income Credits/Volunteer Income Tax Preparation services, Senior Services, Financial Literacy, Group Residential Housing, Long-Term Homeless). Supporting the mission of the Agency through daily work and while representing the Agency in public. Serving as mentor for new staff, including assisting with training, allowing them to shadow and sharing tips, strategies and information to increase their skills. Conducting outreach to recruit potential program participants, community organizations and service providers and establishing and maintaining partnerships and on-going communication. Scheduling, organizing and teaching both life skills education classes and local parent groups. Conducting one-on-one budget and credit counseling sessions. Scheduling and conducting public benefits program (such as Supplemental Nutrition Assistance Program, Medical Assistance/Medicaid or other governmental/subsidized health insurance program) outreach, screenings and application assistance which may involve attending events as directed by supervisor. Working from satellite offices throughout the service area, as assigned. Recognizing existing and emerging needs of participants and communities and developing programmatic and resource recommendations to improve or develop programs. Assessing and recognizing need for professional development and communicating and requesting applicable training support to department leadership. Researching the availability of professional development opportunities to address emerging trends and issues and attending meetings, workshops and training sessions as requested by supervisor, . Perform other essential job tasks as assigned by supervisor, and/or Department Director. 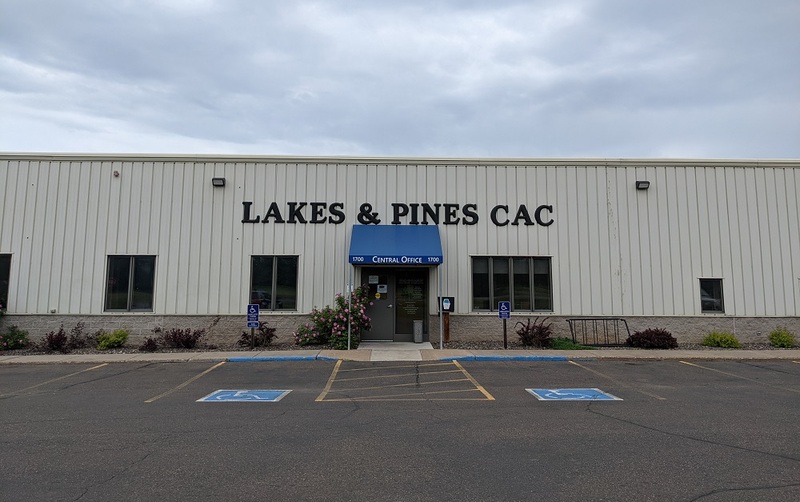 Conduct intake interviews with applicants seeking assistance and determine eligibility by completing all necessary forms legibly and accurately. Coordinate and/or assist co-workers and volunteers to operate all volunteer based programs such as the garden seed project and volunteer income tax assistance sites. Tasks may include tax preparation and review, volunteer management and site security. Organize and/or present at community forums, write pieces for publications, and participate in networking meetings. Conduct trainings on programs, services and resources for intra/inter-agency staff, as required. Have specialized knowledge of resources, skills and flexibility which can be used to help clients resolve crises or move out of poverty, including but not limited to: knowledge of the Social Security application process; knowledge of how to prepare income taxes and property tax/renters rebates; knowledge of how to prevent eviction/foreclosure; knowledge of mental health/chemical dependency/county human services programs. Assist with Agency’s electronic document imaging/filing system and procedures. Provide administrative support when other staff is not available to do so. All secondary job functions as assigned by supervisor and/or Department Director. High school diploma or G.E.D required. Post-secondary degree preferred or three to five years of experience working in a related field. Effective interpersonal, written and verbal communication skills. Proficient math and computer skills and knowledge of Microsoft Office programs. Must be able to work effectively with diverse individuals of all ages and low-income people in either the office, home or public environment. Ability to multi-task, work independently and cooperatively with others and in crisis situations. Must have knowledge and awareness in the areas of budgeting, social & human services and assistance and supports available in the area through private service providers, county, state and federal programs. Ability to assess situations, prioritize solutions and make appropriate decisions. Ability to design and deliver presentations to any size public group. Must be able to meet the travel requirements and work schedule, flexibility of the position, which may include evening and weekend commitments. Periods of travel via vehicle or public transportation and occasional air travel for business. Stationary sitting for extended periods of time. Extended periods of telephone and computer usage.